Texas Corner Interactive Teller is now open! 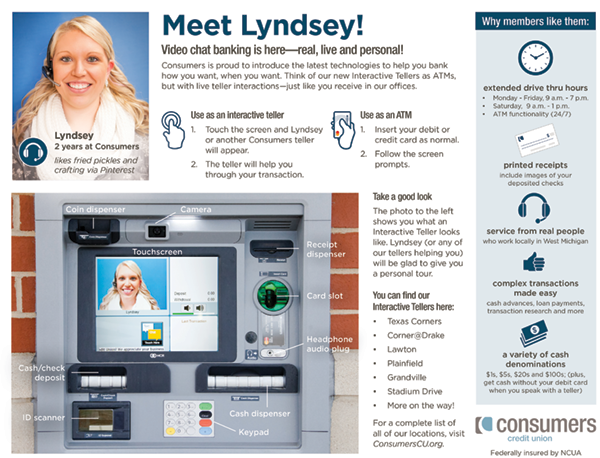 This month Consumers Credit Union opened our first freestanding, drive-up Interactive Teller in Texas Corners. It looks like an itty-bitty version of one of our offices. Don’t let it’s small size fool you though, this little Interactive Teller has full-sized capabilities! An Interactive Teller is a teller and ATM rolled into one machine. You can use the ATM function. Or if you need more than a withdrawal, a real, live, living, breathing person sitting in Kalamazoo will help you with just about any regular banking transaction. Deposit? Loan Payment? Transfer? 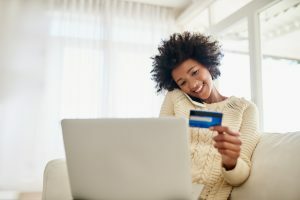 Transaction history? No problem! One of our tellers will be able to help you. 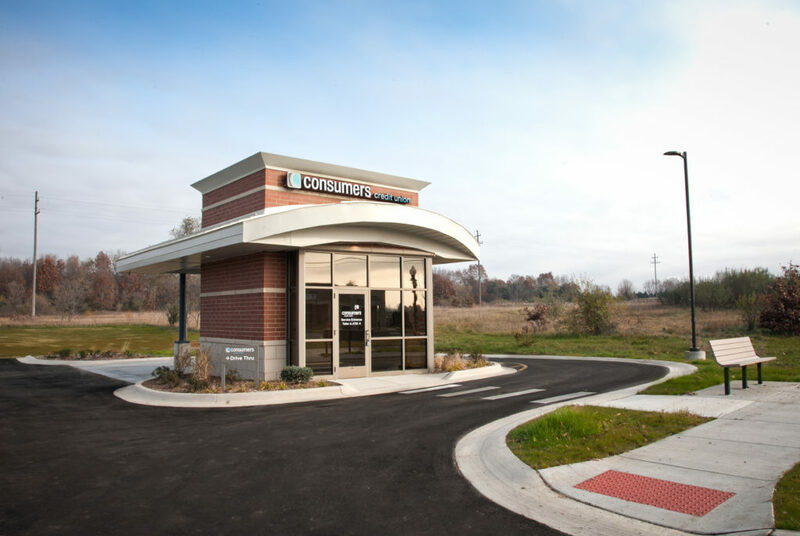 Since these tellers are all centrally located in Kalamazoo we can offer extended service hours. Drive-thru Interactive Tellers are available until 7:00 PM Monday through Friday and 1:00 PM on Saturdays. Still a little apprehensive about our new fangled gadget? If we haven’t convinced you yet, come join us at our newest location on December 20 and try out our Interactive Teller. Staff from our Mattawan and Lawton offices will be handing out coffee, hot cocoa, and donuts from 9:30 to 11:30 a.m. Here’s a handy guide to walk you through the cool features and services offered at Interactive Tellers. Great looking building. I love the Interactive teller machine for full transactions and the option of the ATM for the quick cash withdraws. Thank you for adding this to Texas Corners. So nice having this down the street from my house! Quick and easy to use! 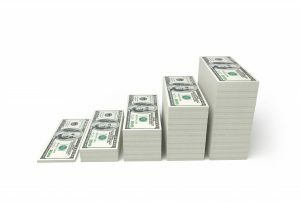 This is a great example of what credit unions and banks across the country can do to efficiently serve small markets while providing both transactions and high value services. Also an excellent strategy to retain market connection while reconfiguring branch networks and as a market introduction alone or as a component of a lending center. Bravo!